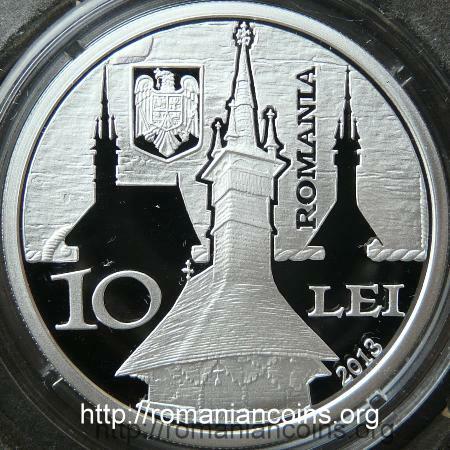 Obverse: coat of arms of Romania, ROMANIA, face value 10 LEI, year 2013, an image of the "Archangels Michael and Gabriel" wooden church from Rogoz, contour of the church seen from the front and from the sides, on the background of a portion of the outer wall, adorned with torsade Reverse: a portion from the altar's apse, representind the Holy Trinity, inscription "monumente de arta medievala crestina" and "BISERICA SFINTII ARHANGHELI ROGOZ 1663" meaning "christian feudal art monuments" and "HOLY ARCHANGELS CHURCH ROGOZ"
The coin belongs to the series Christian Feudal Art Monuments. 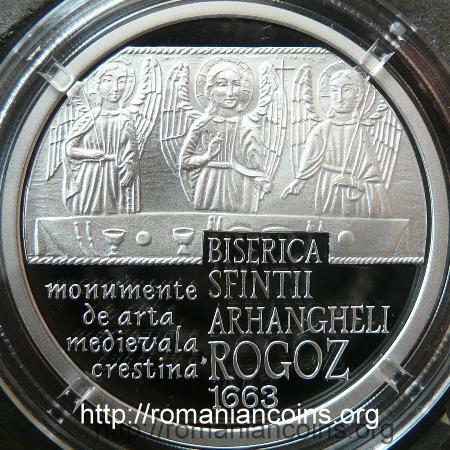 To the same series belong the 500 lei from 2002 gold coins with Bistriţa Monastery (from Moldavia), Mogoşoaia Palace and with Colţea Church, the 500 lei from 2004 silver coins with the Monasteries Three Hierarchs from Iaşi and Cotroceni from Bucharest, the 5 lei 2006 with the wooden church of Ieud-Deal, three silver coins of 10 lei issued in 2008 with the monasteries of Cozia, Voroneţ and Sîmbăta de Sus and three silver coins of 10 lei issued in 2011 with the church of Strei and monasteries of Humor and Hurezi. The village of Rogoz, first mentioned in a historical document from 1488, is placed in Maramureş county, not far from the small city of Tîrgu Lăpuş. According to the folk tradition, the wooden church dedicated to the Holy Archangels Michael and Gabriel was built in 1663. The church replaced an earlier building which was burned by the Tatars in 1661. The present painting dates back from 1785. This wooden church church, together with seven others, all from Maramureş, were included in 1999 in the UNESCO World Heritage sites list.